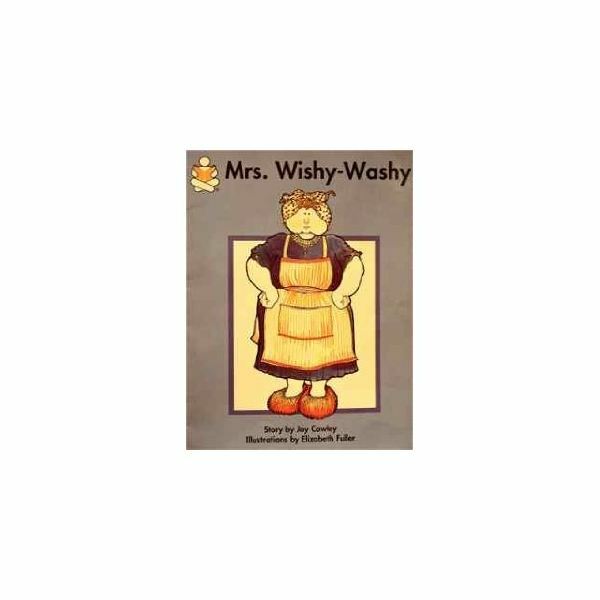 Mrs. Wishy Washy is a favorite book choice for shared and guided reading in the younger grades. Young children love this delightful story about Mrs. Wishy Washy and her quest to keep her farm animals clean. Its repetitive, easy to follow text and supportive pictures make it a perfect choice for beginning readers. Teaching students story mapping is easy with this Mrs. Wishy Washy lesson plan. If you are teaching this as an introductory lesson, make sure that the students are already familiar with the story. It also works well near the end of a week-long shared reading unit on the book. The animals get in the mud. Mrs. Wishy Washy gives them all baths. The animals all get right back in the mud. Now write each of the story elements on a separate piece of paper. Divide the children into small groups and assign each group one of the story elements to illustrate on a piece of white paper. Depending on how many children are in your class, you might have two groups work on each part, so that you end up with two pages for each element. After all of the papers are finished, collect them and label the appropriate story element on each page. Then arrange them into a book (or two, if you made double pages). Display the book in the class to remind the children how they can use story mapping as a comprehension strategy when they are reading. On another day, read a familiar story to the children and give them a story map to complete with the same story elements you included in your original story mapping book. You could also make five-page books with a story element written on each page and then have the children illustrate the books for the story you read. As a first grade teacher, Mrs. Wishy Washy was always one of my favorite shared reading books to use for making an interactive writing wall mural. Students will once again identify the important parts of the story as well as working on skills, like beginning and ending sounds, punctuation and sight words, as they work through the interactive writing process. Tell the students that they are going to work as a class to make a large picture that retells the story of Mrs. Wishy Washy. First, brainstorm a list of the things you will need in your mural; the animals, Mrs. Wishy Washy, a tub, a mud puddle, etc. Then let the children work in groups of two or three to illustrate and cut out the things on the list. If you run out of things, choose a few groups to work on background scenery like the sun and clouds or a barn. As each group finishes its job, arrange the pictures onto a large piece of bulletin board paper. Then let the children help you make labels for the mural on sentence strips using the interactive writing process, where students and teacher “share the pen” to compose text. You can also add the title and author to the top and even a few speech bubbles or sentences about the story. When it’s finished, hang it in your classroom where the children can see it. Place a few pointers near it and it makes a fun “read around the room” activity for center time.